Let’s Redefine “Poor” | Picture This! As I said in the About Me section, the point of my photos and blog is to call attention to people who need help in some way. 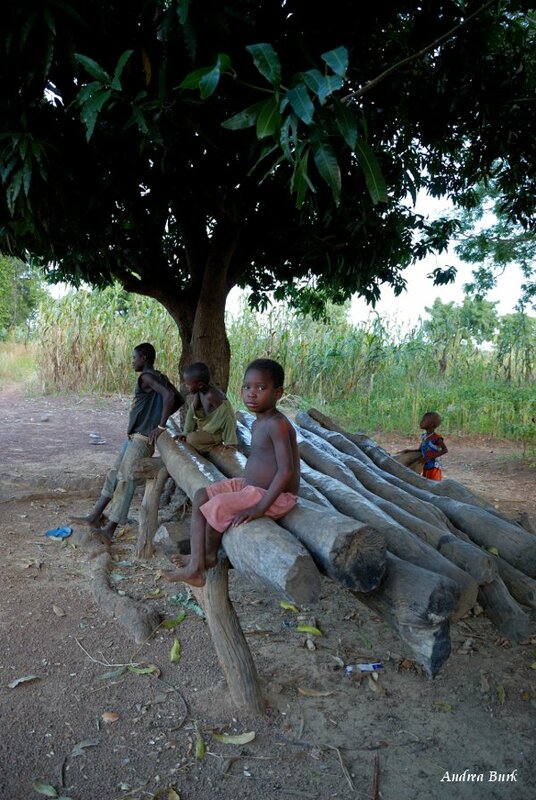 The country of Burkina Faso is one of the top ten poorest countries in the world, with the rural Dagara being on the lower end of the the spectrum of poverty. Instead of falling into the temptation of shaking our heads sadly and then mostly ignoring it, I would like to challenge all of us to start to confront the general issue of poverty by looking at the specific poverty of the Dagara. What images or ideas come to your mind when you think of a poor person? Do you think of someone in your own country who lives in a run down house and doesn’t have the same things you have? Do you think more globally, yet abstractly with the images of National Geographic and Ethiopia engrained on your mind? What are your emotional reactions and thought processes? Cute group of kids in Dano. They are somewhat dressed up for a party. It’s not uncommon to read or hear a comment such as “Why are we sending money off to some foreign country to help the poor? We have poor people of our own we should be helping!” We will then often hear another “side” to the coin which sounds somewhat judgmental toward the poor themselves, insinuating that they have enough but just don’t know how to budget or manage their money. Let’s remember that it’s not helpful to anyone in this difficult situation to be judgmental on either side of the issue. Although poverty is definitely relative to the country and culture in which it exists, I believe we need to also step back and redefine what poverty actually looks like. 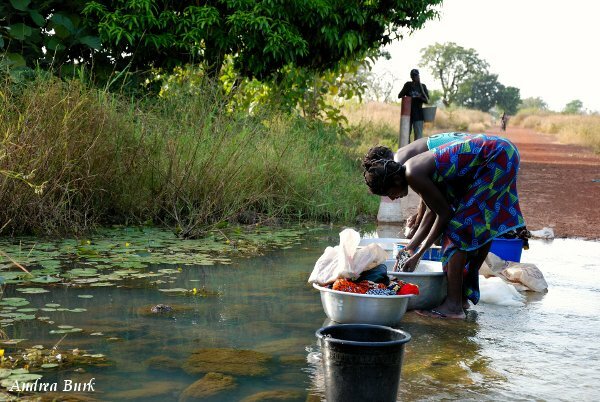 Ladies washing clothes where a stream runs over the road. There are all kinds of poverty in this world: physical, spiritual, mental, etc. Many times the poverty that comes to our minds and seems more prevalent in the U.S. involves more of the mental attitudes that come with physical poverty. Although there are impoverished attitudes in Burkina, the poverty that strikes someone visiting here is overwhelmingly physical. Our team recently had some visitors who were quite taken aback by the poverty here. They made the comment that seeing it in person is a completely different experience from the two-dimensional photos and articles they might see back in the safety of their own home and environment. As a starting point of comparison, this graph of the amenities owned by people classified as poor in the U.S. says that a family of four is poor if they earn around 22,000 dollars or less per year. This is more money than the majority of the Burkinabe could ever dream of seeing. 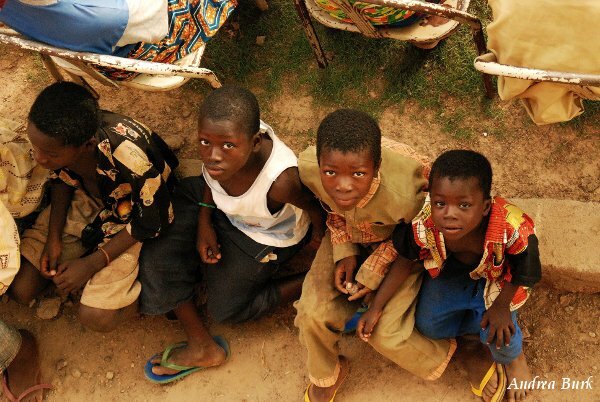 The average worker in Burkina earns only about 2 dollars a day. 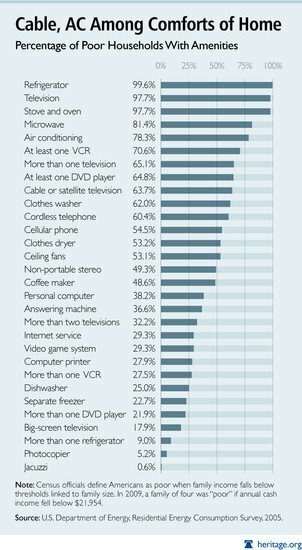 According to this chart, almost all of the poor in the U.S. own a refrigerator, television, stove and oven, which most Americans would definitely consider the basics. These are followed by microwaves, air conditioning, and VCRs and DVD players. After this begins the “extras” of more than one or two televisions, cordless phones, washers and dryers, and stereos. These things are available in Burkina, but only in the towns and cities. The basis for most of these appliances, electricity, is not out to the villages yet. A man on his way to sell bananas at the market. 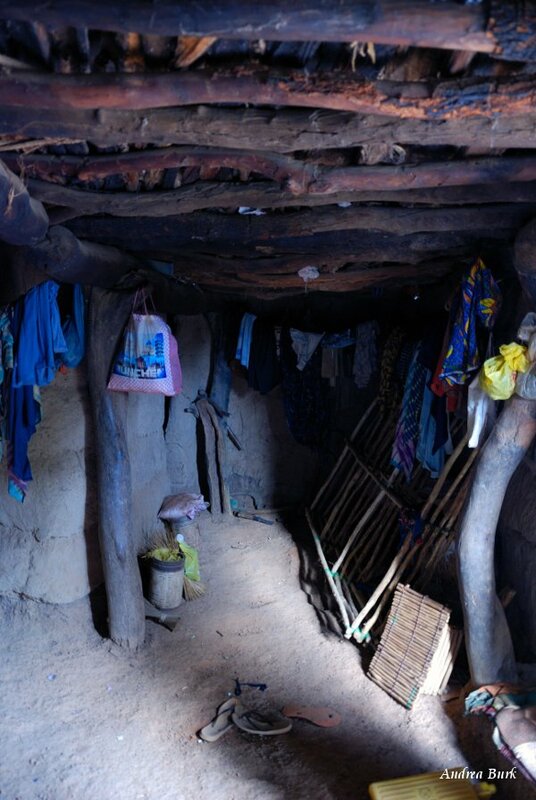 In villages, as opposed to towns and cities, living conditions can be harsh. Since there is no electricity, all the amenities available in the Western world and in the cities are completely irrelevant to their lives. Instead of a washing machine, women wash their clothes in the nearest body of water, often having to do so without soap to really get them clean. Instead of flipping on a light switch, they have oil burning lamps. If they are broken or out of fuel, people will have to go without until they can save money and make it to the next weekly market. The market could be near or far, depending on what they need to buy, and most people will have to go on foot. Many times you can see an elderly woman who has just walked a long distance with her shoes on her head in order to help them last longer. 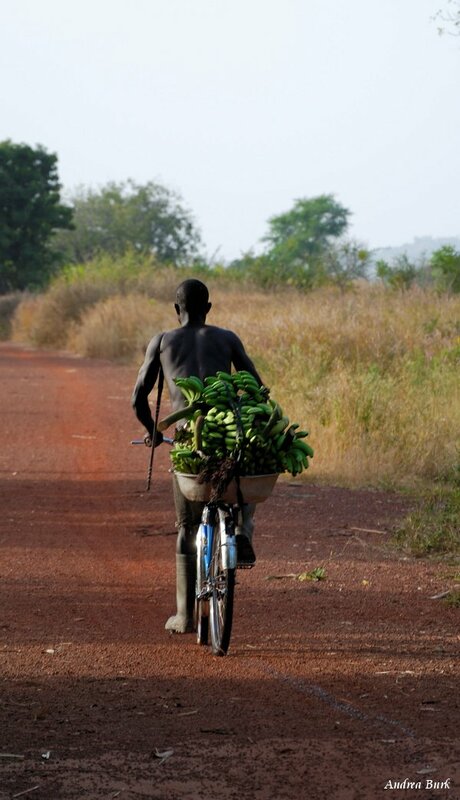 In the remote villages, fewer people have bicycles and even fewer have motorcycles. 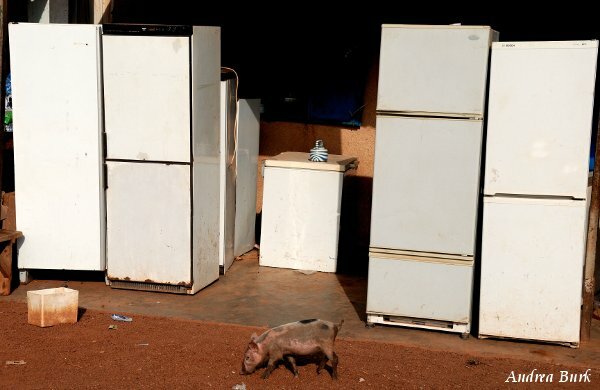 Used refrigerators for sale on the main road in our small town of Dano. Love the pig! As far as attitudes go, in Burkina, a person can work really hard all day long and still not get anything to eat that day, or possibly only one meal. This can happen for a variety of reasons, one of which is that they are in the middle of the hunger months mentioned in the last post, and are trying to make their food last as long as possible. It’s not uncommon for a person to go an entire week without eating. There are also those who feel defeated by poverty, or just don’t think that there is a way to lift themselves out of it. However, most are just working as hard as they can. The interior of a village home taken with the natural light coming from the doorway. Notice the roof made of wood. A wonderful "couch" of logs in the courtyard. They sometimes sleep here as well when it's too hot to sleep inside. The interior of a village home functions more as just a place to store things and sleep than as a place to hang out doing leisure activities. Most of their lives are spent outside, so their chairs and other places to sit are in their courtyards. 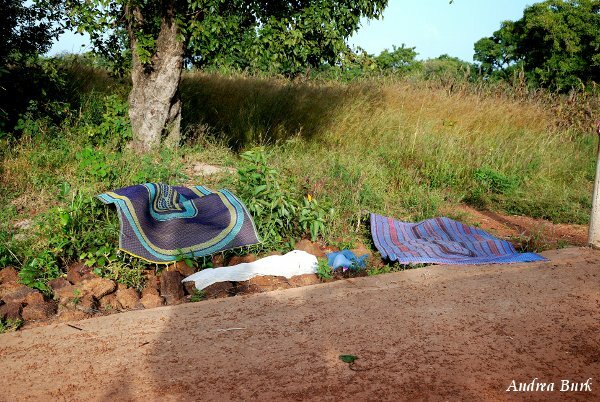 When they do go to sleep at night, it’s not usually on a bed, but on a mat on the packed down, hard earth floor. Some mats are very thin, woven from plastic, while others are made out of a type of hollow reed or straw. Sometimes they will have a wooden bed frame with a straw or foam mattress, but also many times they may have nothing but flattened cardboard boxes. Examples of the thin plastic sleeping mats, drying after being washed in the stream. Another kind of sleeping mat made out of straw. They roll them and hang them up during the day to keep them clean. 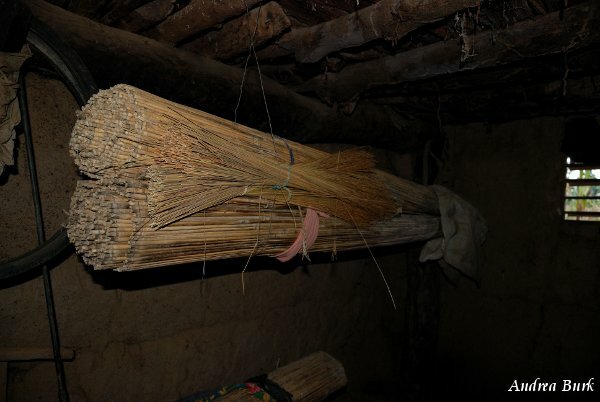 The smaller bundles attached in front are brooms. Kids playing marbles in the courtyard of their home. Despite all the difficulties, people are just living their lives. They have times of happiness and celebration as well as sadness and mourning. They work to make their food or earn a little money. 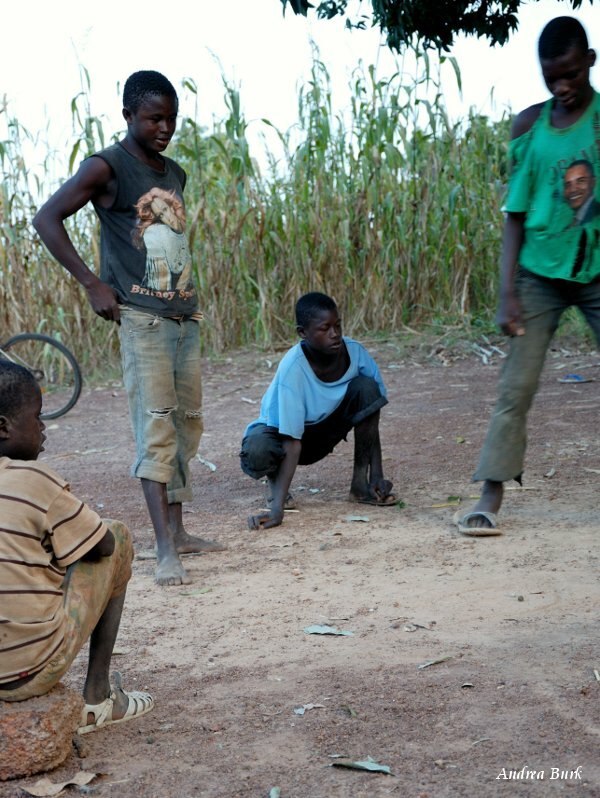 They play soccer or children play marbles or other made up games. They accept life the way it is, yet for the most part, don’t give up. What do you think? This really only scratches the surface of this issue. In future posts we will discuss how this affects the education and medical systems. I would love to get a dialogue going. Has this changed your perspective on poverty? Do you know any poor people near you? Have you seen good things being done to alleviate poverty? What do you think can be done to encourage those in poverty to think positively about changing their situation? I’d love to hear any thoughts you have on this! Posted on October 29, 2011, in Uncategorized. Bookmark the permalink. 12 Comments. Thanks Kem! Those are my hopes exactly! I really like your blog! As I was reading, I was recalling my experience living in Haiti and thinking about family members who are living under such circumstances. People just go about their lives, work hard, focus on their relationships, and accept the reality of things. I think the average person doesn’t realize how poor he is or if he can change anything about his circumstance however difficult that might be. It is a great challenge given their limited resources. They can’t do it alone! Thanks! I think you’re right that the average person is perhaps too busy making ends meet to sit around comparing his lifestyle with someone who has more. I think also they might know the reality of their situation but are surrounded by others in the same situation and just don’t see a reason or way to change. Hi, Andrea! This reminds me so much of our years in Botswana… I learned that the worst poverty doesn’t involve living without “stuff,” but living without healthy relationships. Hi! I totally agree. People can be happy with next to nothing materially, but are miserable without family, and especially without God, the most important relationship of all. I think of the young girls who walk around selling bananas, etc. One we know has lost her mother and was sent to live with her uncle and his wife, who doesn’t really like her. She has many times of struggle and sadness and really needs a good parent. I’ve tried in the little interactions I’ve had with her to guide her a little but there’s not much we can do when she technically has a parent. Frustrating custom-how they send their kids off like that! Thanks again! (I’ve been trying to reply but the internet kept going out each time! ha) I agree with what you said. It is hard. We’ve grown a lot in this aspect and still have a lot to learn! We’ve tried different things to help. The jealousy issue popped up when we tried to give out flip flops, but had a limited amount. Because of the culture, the grownups felt they should all have the new shoes first…even if they didn’t fit them and even if they already had shoes. Ugh. Now we have a budget for helping people and it usually is for medical bills or school fees. And I’ve just started this blog to make people in the US, etc. more aware of what’s going on with the hope of future action. I think we get into a mode of acceptance and justify poverty away sometimes. While I agree that physical “stuff” is not the key to happiness or especially salvation, I think we need to minister to the whole person as well. It’s not an easy topic and I’m just starting to really delve into it. Thanks, Andrea. After living here 10 years, it strikes me over and over again how people live here. We can also see how spiritual darkness plays into this situation and how much people need to be saved from this! It’s our prayer that things will change and that what we do here will help people to receive the love of Christ and spiritual and physical health! Looking forward to your next post! I look forward to reading this post to my girls, who sometimes find it difficult to think of a blessing they have on a given day! I think they believe we live in poverty! 🙂 I think it’s just what we get used to and if we don’t think about different ways of life, we get caught up in our own! It even happens over here with us! Human nature I guess.